These words so eloquently spoken by George Schaller poetically portray his life’s work. 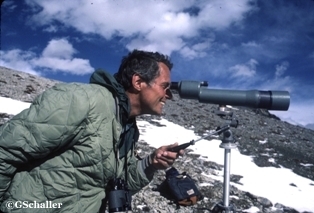 Recognized by many as the world’s preeminent field biologist, George Schaller has many titles, mammalogist, naturalist, conservationist and author. Born in 1933, in Berlin, George grew up in Germany but moved to Missouri, USA as a teen. At age 22 he received a Bachelor of Science degree from the University of Alaska. It was here in Alaska that he realized that his passion for wild animals in boyhood could become a career. Along for the ride of a lifetime has been his wife Kay, who he say is “the perfect co-worker”, and their two sons. Schaller’s work has spanned the globe. At 26 he travelled to Central Africa to study and live with mountain gorilla of the Virunga Volcanoes, pioneering the study of mountain gorillas before Dian Fossey with his epic two-year study. Less than ten years later he conducted one of the first studies of social behaviour and movement of Africa’s big cats. Five years after that George was studying the Himalayan bharal, or blue sheep, as well as the elusive snow leopard in Nepal. In the late 1970’s he was in Brazil studying jaguar, capybara, alligator and other wildlife in the region. Next it was off to China’s Chang Tang region, in 1988, to study the emblematic giant panda. Schaller and his wife became the first westerners permitted to enter the remote region and it was here that he refuted the notion that the decline in the panda population was due to natural bamboo die-offs, and found that it was actually due to frequent capture of the panda, owing to its popularity, that was the biggest threat. Not only has Schaller studied previously known species but has also been a part in discovering them as well. In 1994, Schaller along with Dr. Alan Rabinowitz were the first scientists to discover the rare saola, a forest dwelling bovine in Laos. Due in part to Schaller’s work, over twenty parks or preserves worldwide have been established including; Alaska’s Arctic National Wildlife Refuge, Shey-Phoksundo National Park in Nepal and Chang Tang Nature Reserve, one of the world’s most significant wildlife refuge. From wild and free to captive and cared for, George has also worked closely with zoos and is senior conservationist at Bronx Zoo-based Wildlife Conservation Society. Another organization that George Schaller is a member of and few have heard of is Panthera, where he is vice president. Founded in 2006, Panthera’s sole mission is conserving the world’s 36 species of wild cat. Panthera utilizes the knowledge and expertise of the world’s top cat biologists and develops, implements and oversees range-wide species conservation strategies for the world’s largest, most imperiled cats. George Schaller is not just a conservationist but an author that has brought his passion to the masses with over 15 books on African and Asian mammals, 100’s of magazine articles and dozens of books and scientific articles about tigers, jaguars, cheetahs, leopards, as well as wild sheep and goats, rhinoceros and flamingos. One of which, The Serengeti Lion won the National Book Award. His books are certainly not your bland scientific observations with countless diagrams but rather enriching stories of wild animals that tug at your heart-strings and witty observations that even bring the seemingly boring wild sheep to illuminating life. Schaller’s life’s work has not gone unnoticed. He has received countless awards including the National Geographic’s Lifetime Achievement Award, the World Wildlife Fund’s Gold Medal for “Contributions to the understanding and conservation of endangered species”, as well as many others. 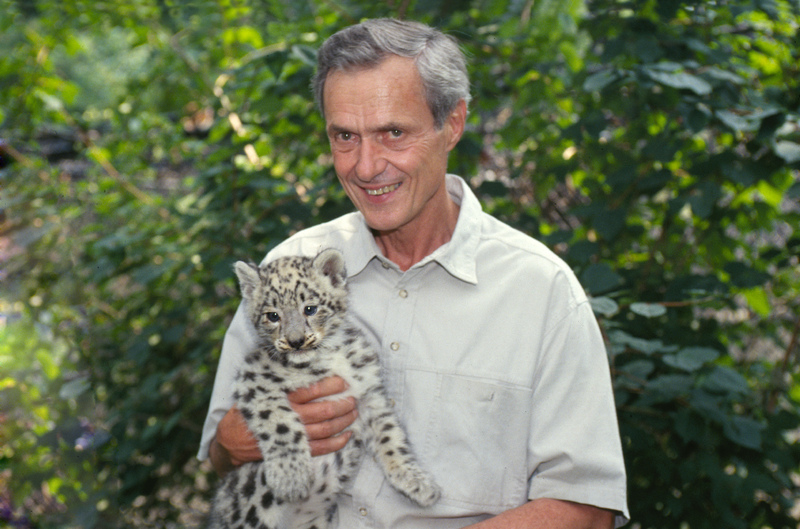 George Schaller’s work in the field of conservation has spanned over half a century. His dedication and hard and thorough work has reaped a myriad of good fortune not only for himself and his family, but for wildlife, wild places and the future of conservation efforts around the world, making him a Wildlife Ambassador.